Scientific Name: Paracanthurus hepatus var. 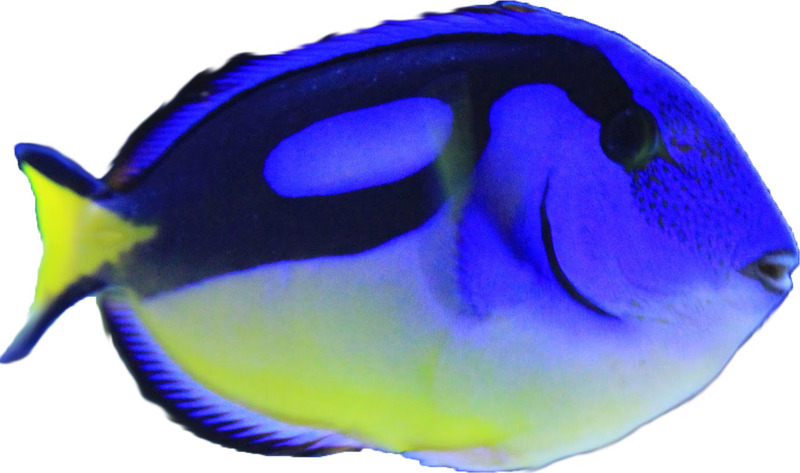 Food/Feeding: Herbivore Notes: The Yellow Belly Regal Blue Tang is a gorgeous color variety of the popular Blue Tang. Though it shares the attractive coloration of the Blue Tang, the Yellow Belly Regal Blue Tang boasts a richer, deep-blue coloration and a brilliant yellow coloration that covers a greater portion of the body. The yellow coloration, most prominent on the caudal fin (tail), continues across the belly region, giving the Yellow Belly Regal Blue Tang an exciting boost in color. Small Yellow Belly Regal Blue Tangs will not exhibit the yellow belly coloration until they mature. Combined with the signature bold black markings resembling a painter's palette, the Yellow Belly Regal Blue Tang is sure to be an impressive addition to reef or fish-only aquariums.